In 1979 then Bord na Móna Managing Director, Lewis Rhatigan, commissioned Louis le Brocquy to produce a tapestry to celebrate what was then felt to be the midpoint of Bord na Móna’s life span. 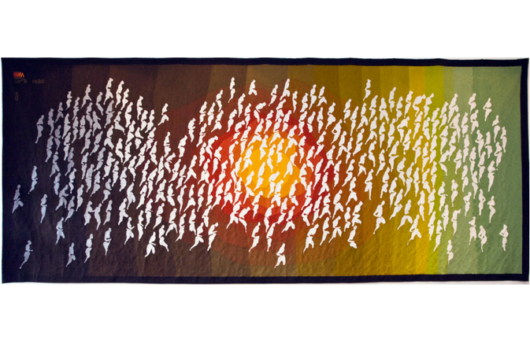 The eight square metre tapestry was finished in 1980 and le Brocquy reduced it to a simple theme which showed the energy derived from the turf itself which is expressed in the sun like form in the centre and the colour scheme representing the gradual transition from bogs to pastureland. All over this are the masses of people traversing the time and space of this journey. That is how Le Brocquy described it himself. When it was unveiled in our former Head Office in Dublin, Rhatigan asked one of our porters what he thought of it. He said it looked like souls trapped in purgatory. Today it hangs in the lobby of our head office building in Newbridge.